Moz is a leading SEO tool provider that uses both basic and advanced research tools to improve your search engine optimization. In short, Moz offers keyword research tools, a SEO keyword generator, and link analysis that gives detailed data on your inbound links and link quality. The best thing about Moz is that it provides a vast selection of research tools. The list of options and features it offers may daunt even experienced users. Nevertheless, the vendor provides tutorials to help you improve you SEO program and understand more about SEO tactics in general. A technical support team is always one call away from solving queries and answering questions. Basically, Moz brings the top SEO tools under one roof and provides users with the resources and knowledge needed to use them and optimize their website. It is an ideal app that small businesses can use to attract traffic to their website. At the same time, you are not expected to pay enormous amounts to get grasp on its functionality – the pricing scheme is flexible, to say at least, and offers plans for businesses from all scales. Moz helps you identify the relevant keywords that you can target for your software. This enables you to prioritize them in your SEO strategies. You can also import, export, and build keyword lists with the tool. It shows you detailed information about your lists such as its total volume, difficulty, priority, organic CTR and your score. Moz monitors if there are any issues in your site that block it from gaining high traffic. This includes missing title tags and broken redirects, among others, which can be shown on charts with breakdowns of issues. By solving these technical problems, you can ensure your site’s SEO performance and strategies to be more effective. With new data added daily, Moz offers tools for link analysis, live link index, and competitor research. For instance, it offers you insights on weighing on high-ranking sites. It also helps you in understanding the value of how your internal and external links can impact rankings in SERPs. To let you know which of keywords are performing, Moz empowers you to monitor your keyword’s ranking performance over a specific period of time, a week or a month. You can also track your competitor’s SERP movement to help develop yours and reveal any SEO strategy gaps. Moz provides an SEO toolbar for you to view any SERP or page instantly. It lets you compare link metrics and examine your ranking potential with Domain and Page Authority. It also has an on-page highlighter, page overlay, and custom searches. Each company has different needs and needs an application that can be personalized for their size, type of workers and clients, and the particular industry they are in. For these reasons, no system can provide perfect tools out-of-the-box. When you try to find a software app, first be sure what you need it for. 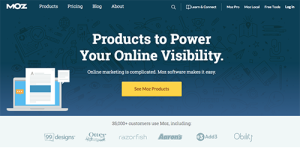 Read some Moz reviews and ask yourself do you desire basic features or do you require sophisticated tools? Are there any industry-specific tools that you are looking for? Find the answers to these queries to help your search. There are lots of elements that you need to consider and these include your budget, particular business needs, your organization size, integration needs etc. Take your time, try out a few free trials, and finally choose the platform that presents all that you want to boost your organization effectiveness and productivity. How Much Does Moz Cost? We realize that when you make a decision to buy Search Marketing Software it’s important not only to see how experts evaluate it in their reviews, but also to find out if the real people and companies that buy it are actually satisfied with the product. That’s why we’ve created our behavior-based Customer Satisfaction Algorithm™ that gathers customer reviews, comments and Moz reviews across a wide range of social media sites. The data is then presented in an easy to digest form showing how many people had positive and negative experience with Moz. With that information at hand you should be equipped to make an informed buying decision that you won’t regret. What are Moz pricing details? What integrations are available for Moz? If you need more information about Moz or you simply have a question let us know what you need and we’ll forward your request directly to the vendor.